Wouldn’t you look good in a new t-shirt or hoodie? We think so. That’s why we designed a bunch of great gear and set-up a store. We earn a little bit of revenue on each sale and we roll that straight back into the blog and our public relations and lobbying efforts. We’d love it if all our visitors and regular readers outfitted themselves in our stuff. One day, it will be a collectors item! Check it out. If you’re looking for a good poker room to see a few flops, go to Scarlet Poker, our founding sponsor. They’re part of the Tribeca Tables Network and as I write, there are 12,000 players at the tables, which is big growth ever since the gambling ban went into effect. And they have a sweet deposit bonus too. If you just want to polish your game, we’ve put together a great selection of poker books, including Harrington’s series on tournament play. Nothing better than NOT being the fish at the table. Thank you for your support! We now return you to our regular programming! 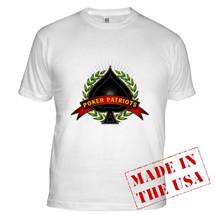 Poker Patriots is proudly sponsored by Scarlet Poker. In the current climate, with poker rooms dropping the USA everyday, it’s great to see a group that won’t “cut-and-run.” This blog and our efforts would not be possible without their generous support. If you’re a player – in America or anywhere in the world – who cares about the great game of poker, we hope you support them too. Click here to go play.